Item # 317121 Stash Points: 295 (?) This is the number of points you get in The Zumiez Stash for purchasing this item. Stash points are redeemable for exclusive rewards only available to Zumiez Stash members. To redeem your points check out the rewards catalog on thestash.zumiez.com. Accentuate your flat surfaced belongings with a touch of a chic boudoir with Open925's Heartbreak Motel Sticker. This peel and stick accessory features a vintage-like faux motel graphic of a flirtatious pinup girl laying across a heart. 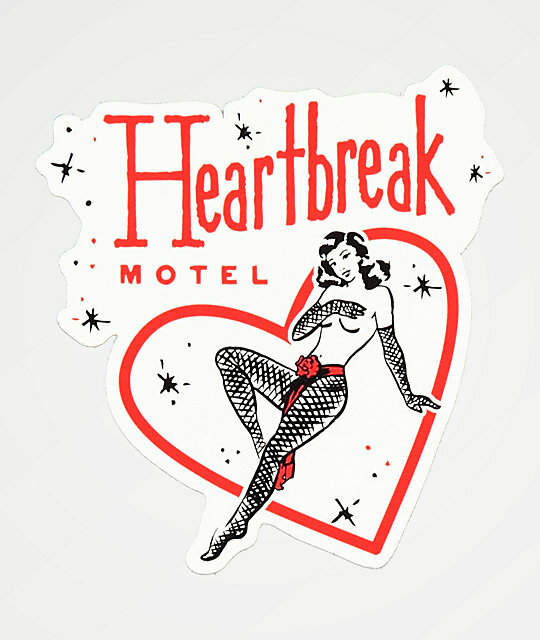 Heartbreak Motel Sticker from Open925. Faux motel and pinup girl graphic. 3.75" x 4" | 9.5cm x 10cm (approx. ).